Be sure to check your owner's manual for your manufacturer's recommendations for scheduled maintenance services. You may be surprised to find out that most modern cars, trucks or SUVs can go far longer than the old adage of getting your oil changed every 3 months or 3,000 miles. This is because vehicles are being manufactured to a higher degree of quality. That being said, it is all dependant on your driving habits and driving conditions. It is important to keep in mind that your factory's suggestions for service are based on ideal driving conditions, long stop and go commutes combined with extreme weather can quickly be considered severe driving conditions which can significantly shorten time between service intervals. If you're not sure if you need an oil change or have other maintenance service questions we'll be happy to answer them for you. We can quickly perform a complete inspection on your vehicle and offer you a maintenance schedule based on your driving habits and the current condition of your vehicle. It is generally agreed that regular maintenance on your vehicle is the most cost effective and efficient way to take care of your car, truck or SUV. With each service we perform on your vehicle we can inspect the components that are most susceptible to wear and tear such as the hoses and belts in your engine compartment. Catching cracks and leaks while they're small can help stop them from becoming bigger problems later down the road. 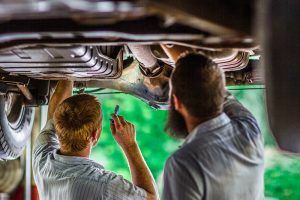 Even if your vehicle is under warranty it is important to note that having maintenance services performed at an independent auto shop will not void your warranty. We will also check to see if your parts are covered before performing any repairs. That's why we pride ourselves on excellent customer service and communication we'll keep you informed every step of the way that way you can make the best decision for you and your vehicle. So if you have questions about vehicle maintenance or the best way to keep your car, truck or SUV going for miles to come, don't hesitate to give s a call, drive on into our shop or conveniently schedule an appointment online for a day and time that works best for you!